Not content with being the richest person on earth, it seems Jeff Bezos is cementing his legacy for the next few millennia. The Amazon CEO has poured $42 million into a giant, 10,000-year clock that’s being installed inside a remote West Texas mountain. The project is the brainchild of Thinking Machines Corporation founder and computer theorist Danny Hillis, who came up with the idea back in 1986. It came from Hillis’ concern that society had a “mental barrier” of looking at the year 2000 as the limit of the future. To overcome this, he proposed a mechanical clock that would last 10,000 years. The project led to the formation of the Long Now Foundation, which Hillis co-founded with Stewart Brand. Drilling at the site began in 2009, but it’s only now that the 500-foot clock is being installed. As electronics can’t be used in a clock that is meant to last 10,000 years, it’s powered by thermal cycles; the changes in day and night temperatures keep it running. A spiral staircase circles its 12.5-foot diameter, and the clock will be synchronized at solar noon. “[Hillis] wanted to build a clock that ticks once a year, where the century hand advances once every 100 years, and the cuckoo comes out on the millennium. The vision was, and still is, to build a clock that will keep time for the next 10,000 years,” wrote the Amazon exec. 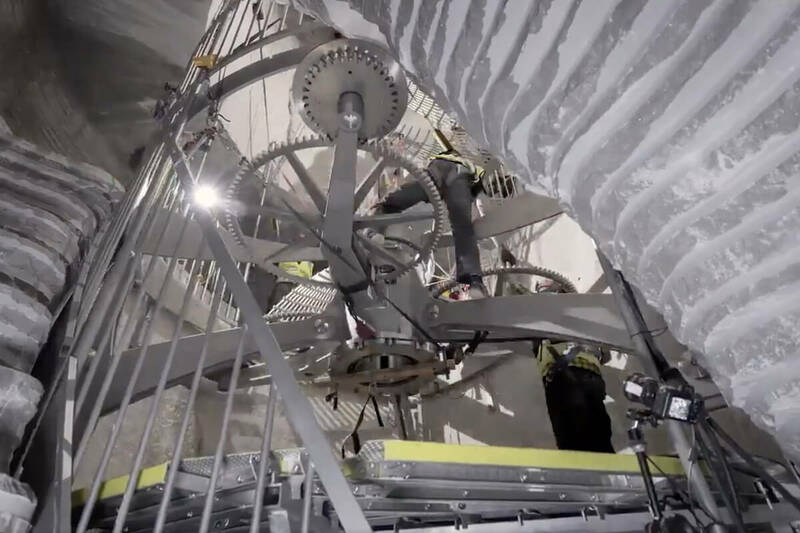 The clock, which is made entirely out of Marine grade 316 stainless steel, titanium and dry ceramic bearings, will only tick forward once a year, though its chime generator will create a different bell ringing sequence each day for 10,000 years. Once every millennium, a cuckoo will come out of its hole. The public will be able to visit the clock when it is completed, though no date has been given. But making the trip won’t be easy: Bezos writes that "the nearest airport is several hours away by car, and the foot trail to the Clock is rugged, rising almost 2000 feet [610m] above the valley floor."